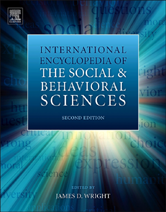 Fully revised and updated, the second edition of the International Encyclopedia of the Social and Behavioral Sciences, first published in 2001, offers a source of social and behavioral sciences reference material that is broader and deeper than any other. Female Quotas in Parliament: Do They Make a Difference? Gender and Technology: From Exclusion to Inclusion? Survival Analysis: Whether, and If So, When?